"Bhakti-rasamrita-sindhu has given considerable discussion about nitya-siddha and sadhana-siddha devotees. 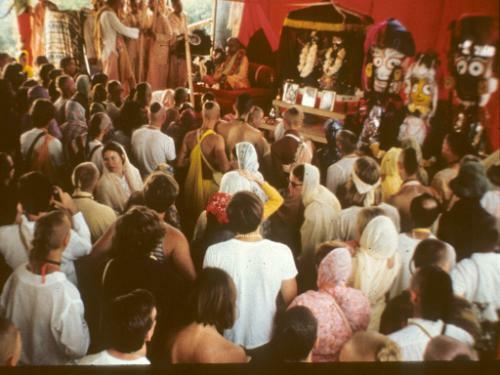 Nitya-siddha devotees come from Vaikuntha to this material world to teach, by their personal example, how to become a devotee. The living entities in this material world can take lessons from such nitya-siddha devotees and thus become inclined to return home, back to Godhead. A nitya-siddha devotee comes from Vaikuntha upon the order of the Supreme Personality of Godhead and shows by his example how to become a pure devotee (anyabhilashita-sunyam). In spite of coming to this material world, the nitya-siddha devotee is never attracted by the allurements of material enjoyment. A perfect example is Prahlada Maharaja, who was a nitya-siddha, a maha-bhagavata devotee. Although Prahlada was born in the family of Hiranyakasipu, an atheist, he was never attached to any kind of materialistic enjoyment. Desiring to exhibit the symptoms of a pure devotee, the Lord tried to induce Prahlada Maharaja to take material benedictions, but Prahlada Maharaja did not accept them. On the contrary, by his personal example he showed the symptoms of a pure devotee. In other words, the Lord Himself has no desire to send His pure devotee to this material world, nor does a devotee have any material purpose in coming. When the Lord Himself appears as an incarnation within this material world, He is not allured by the material atmosphere, and He has nothing to do with material activity, yet by His example He teaches the common man how to become a devotee. Similarly, a devotee who comes here in accordance with the order of the Supreme Lord shows by his personal behavior how to become a pure devotee. A pure devotee, therefore, is a practical example for all living entities, including Lord Brahma."